Jumping in your car and getting away from it all for a few days sounds like a great idea to many people, and it can be enormously good fun. However, doing so without making any preparations could be a big mistake. While your vehicle may appear to be in great condition, you should always conduct a thorough visual inspection as a minimum before heading off on a long journey. Preferably, you should check under the hood as well. To get you started, I have compiled a list of what I consider to be some of the essential points that need to be covered when preparing your car. Tires – In addition to making sure that they are inflated to the correct pressure (you can check the relevant figures in the owner’s manual supplied by the manufacturer) you should check your tires for signs of wear and tear. Make sure that the tread is within legal guidelines and that there are no obvious cracks in the sidewalls. Do not forget to check that your spare tire is also properly inflated and in good condition as this could be vital in the event that you should suffer a puncture en route. Engine oil– Without adequate lubrication, your engine will quickly deteriorate and could even seize completely. For this reason, it’s vital to make sure that your reservoir is topped up before setting off. 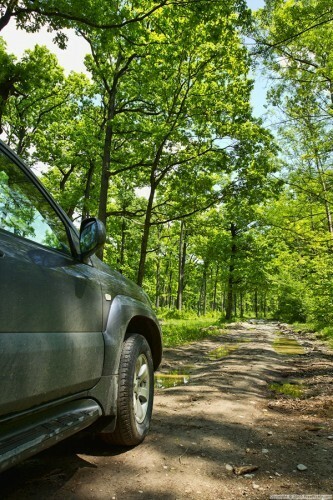 It’s also a good idea to look at the ground where your vehicle is normally parked to check for signs of oil leaks. If you should find any, have them attended to immediately. Coolant – Many modern cars have sealed systems which negate the need to check levels on a regular basis. However, if you are driving an older model, be sure to see that you have plenty of coolant. Fuel – This may sound too obvious but always make sure that you have a full tank before leaving and that you are aware of the location of filling stations that can be found along the route you will be taking. GPS navigation maps should show the position of major stations, making it easier for you to plan your stops in advance. Windshield washer fluid – Although it does not affect the performance of your engine, a lack of washer fluid could cause problems when driving in adverse weather conditions on country roads. Mud and other debris can quickly obscure your view and without enough washer fluid you will need to keep stopping to wipe the windshield by hand. Brake fluid and discs – The ability to stop is just as important as the ability to keep going if you want to remain safe. So, you should always make sure that your brakes are in good condition and that fluid levels are within safe limits. Hoses and electrical connections – Lifting the hood to check that all internal wiring and hosing is securely in place and showing no signs of imminent failure could save you a lot of trouble. Most people do not carry spares of this nature so if you were to encounter any problems in this area you would probably have to wait for a towing service before you could continue on your way. If you follow the above advice, your car should be able to get you safely to your destination. However, you also need to think about the items that you and your passengers may need. Depending on the time of year, you may like to pack some warm clothes that you can put on if you do happen to break down far from civilization and you should always carry plenty of water and food on long trips. Founded in 1999, Car Shop is a prominent used car supermarket, offering a broad range of models in their online catalog and showrooms across the United Kingdom.